When it comes to Halloween decor, I like things a little cool and spooky. 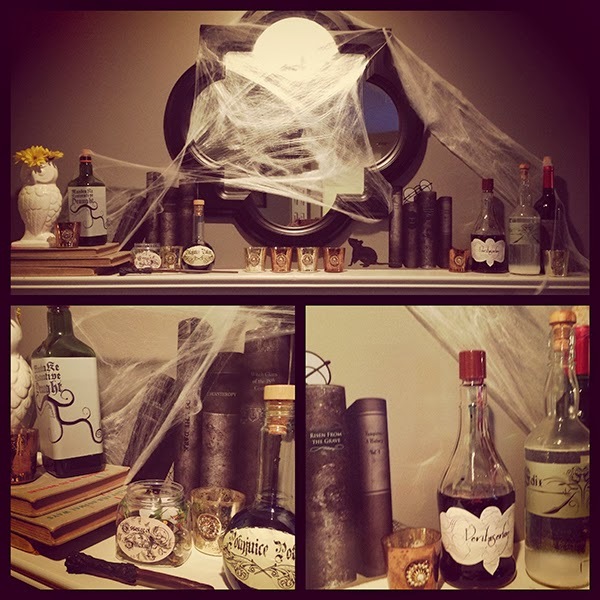 I don't like silly little witches or nasty zombies…but I do like some elegant macabre decor, a la Pottery Barn's style. However, I didn't want to pay that much for something seasonal that I can't use past one month. I don't think skulls translate into Christmas and I love skulls. What to do? I also love Harry Potter, probably along with a great majority of the world. The story is so good, the characters are engaging and the wizarding world appeals to me because it is innately its own place with its own cultures and that is what a good book is all about. When you feel like you are a part of the places hidden around London, the escape into a world both light and dark appeals to young and old. These books were written for everyone, not just for kids. Even the language inside the pages are enlightening-from names of characters down to the very last Bertie Bott's Every Flavor Bean. I think the books and movies are timeless and classic now. I can sit down and be drawn into Hogwarts every time Harry Potter weekend comes on ABC Family (despite the fact that I have every movie anyway). However, when October rolls around and pumpkins are everywhere, that slight crisp chill in the air makes me begin to crave the images of the feast in the Great Hall with floating candles and pumpkins overhead, the warm glow of friendship and those beautiful fall colors of Gryffindor scarves. I recently began re-reading the books, so I am back in love with these characters and their story. Hence, the reasoning behind today's post. I thought it would be fun to create a space on my mantle that was just spooky enough for those who don't know about Harry Potter, and something to make fans that come into my house and smile with understanding. I got lucky at JoAnn's and found a Halloween book decal that was perfectly Potter because every book title was something related to a topic within Harry Potter, there were even some glasses that looked familiar! So I cut the decal in half to create symmetry around my mantle mirror. I flipped around some old books I already had since they weren't subject matters that made sense with the decor, but the color and height added something special. Being a Chi Omega, I have plenty of owls so I brought some of those into the decor (white like Hedwig!). I reused some cobwebs I got last year, which is cheap and easy to use to create that spooky effect. Apparently all spooky things haven't been dusted in a while? I had been saving up unusual bottles for a while now, looking forward to doing this. I let the bottles soak in hot soapy water for a while, then got off what the water didn't with Goo Gone. I designed and printed my own labels based off popular potions in the books/movies and put those on the bottles. I used some food coloring and created some spookier colors for the "potions" and stoppered them with wine corks. To add a little more elegance, I left my mercury glass votives on the mantle. I really like the way it turned out. Yes, I realize I just told you how much of a nerd I can be. If you are interested in the labels for the bottles, please leave a comment below and I will get them to you! Since I made them specifically to fit my bottles, I didn't create a downloadable PDF. I will be happy to resize them for you if you are interested though! Look for bottles of all shapes, sizes and colors within your pantry. My favorite bottle was the "Polyjuice Potion" bottle, which is actually a white wine vinegar bottle. Beakers are a good alternative as well.